upper left: cashel linen (1), edinburgh linen (2). upper right: cotton muslin (3), cotton osnaberg (4). 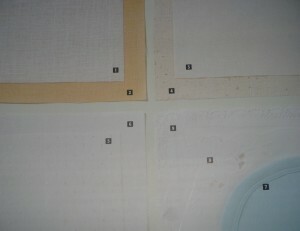 lower left: polyester jacquard (5), polyester moire (6). 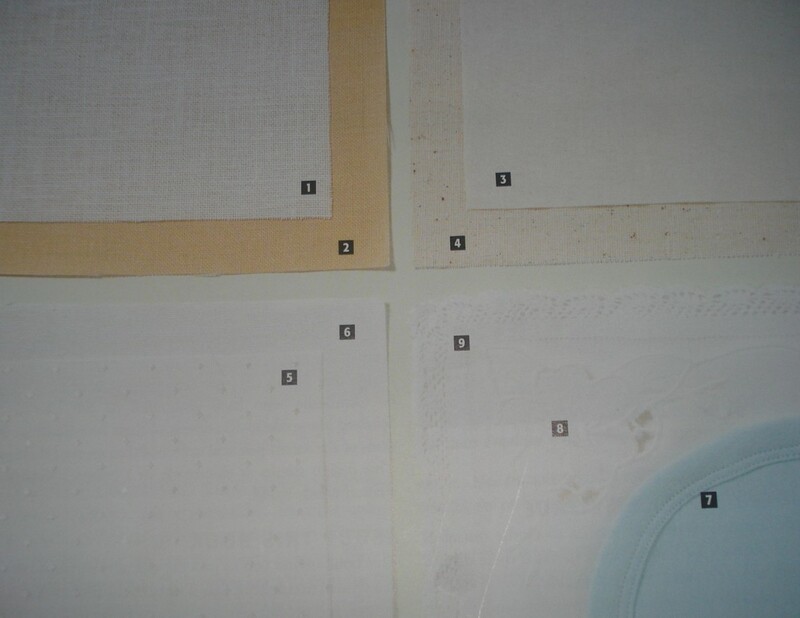 lower right: premade cotton knit baby bib (7), premade cotton cutwork napkin (8), premade lace-edged linen handkerchief (9). with embroidery you enjoy more fabric choices than you would with other forms of needlework. you can choose beautiful dress and home decorating fabrics as well as fine even¬weave linens made for counted-thread work. even fabrics with subtle printed or woven patterns can provide a beautiful background for embroidery. tea-dyed cotton is, a nostalgic favorite for suggesting antique embroidery. one of the many delights of embroidery is adding your personal touch to your favorite ready-made clothing. finished table and bed linens and other “pre-made” items ranging from aprons to tea cozies await only your needle and thread, and an appropriately-sized design.Fabric Weight traditional embroidery fabrics range from lightweight, sheer organdy and fine silk to heavy canvas and linen, and every weight in between. fabric weight is the result of the size of the threads in the fabric weave and how densely those threads are packed together (also known as thread count) during the weaving process. if you are just learning how to embroider, a medium-weight fabric with a fairly dense weave will give you the best results. when choosing a fabric weight, ask yourself two questions: how do i intend to use the embroidery when i am finished stitching? match the fabric weight to the task it will eventually face as a finished project. a pillow for your rough-and-tumble family room will benefit from a medium-to-heavyweight fabric while a dainty boudoir “show” pillow may call for something lighter. how heavy will my intended embroidery be? the weight of the embroidery depends on how many strands of thread you use on your needle as well as how dense your embroidery design is. some designs, such as the summer bouquet, have more than one layer of stitching-in effect, stitching on top of stitching-which adds weight, and needs the support of at least a medium-weight fabric. pay attention to how densely or loosely the fabric threads are arranged. if you consider yourself a beginner, avoid loose, open weaves. Fiber Content a good rule of thumb for beginners is to match the fabric fiber to your stitching fiber. cotton floss on medium-weight cotton fabric is an ideal choice for a novice, as are most cotton blends. what about embroidering on t-shirt knits? once you have mastered a few stitches, stitched several projects, and are ready for something new, give it a try. because knits stretch, baste a tear-away stabilizer (such as sulky’s totally stable) or tissue paper behind the design area to avoid distorting the fabric when you mount it on a hoop. when you are finished stitching, tear away the excess paper around the stitches. COTTON (also written as perle cotton) is thicker than floss, is highly twisted, and has a lustrous sheen. It cannot be separated into strands, comes in several sizes from 3 (the thickest) to 12 (the finest), and is dyed in many colors to match floss. OTHER FIBERS await your exploration once you have mastered a few stitches Silk floss, has a similar weight as cotton floss ,and a particularly lovely “hand” (how it feels in your hand as you stitch). Historically, it’s probably the oldest fiber used for embroidery, and originated in Asia. It’s more expensive than cotton floss, and must be dry-cleaned. Once you feel confident in your skills, try silk floss on a special project. Needlework traditions which developed in the West have used wool and linen for centuries. Crewel wool is essential for crewel embroidery. These fibers are also more expensive than cotton floss, but worth exploring as your skills develop. Rayon, which straddles the boundary between natural and synthetic fiber, has a bright, high sheen which makes it slippery to work with, and is not recommended for beginners. Metallic and synthetic threads are gaining in popularity, and new varieties appear with frequency. Many of them require the skills of an intermediate stitcher, but you can try adding small accents of these fascinating threads to your cotton floss projects to get a taste for their special effects. Silk ribbon is, as its name implies, a thin, flat ribbon that can be threided onto a needle and stitched just as if it were a conventional thread. Silk ribbon is particularly effective in floral embroidery, and creates a three-dimensional look. 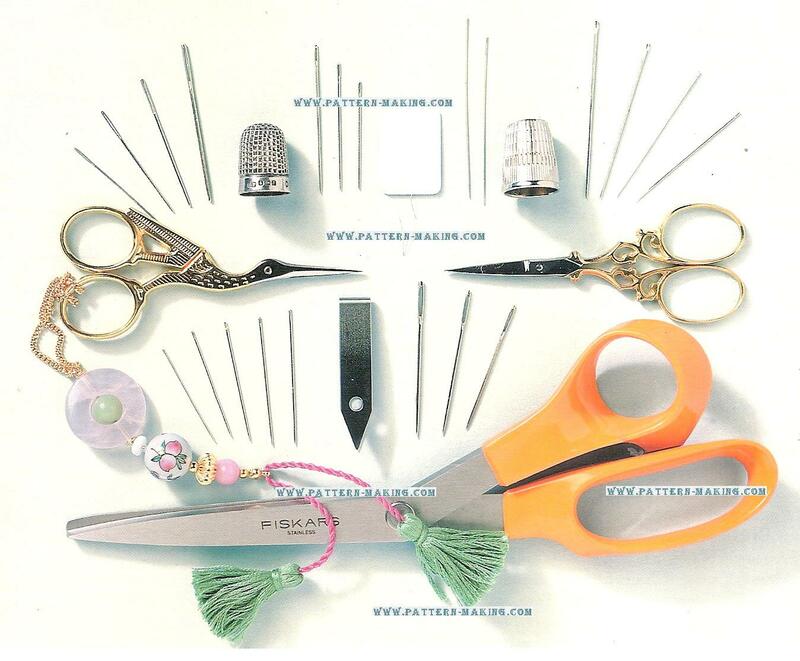 clockwise from bottom: shears, embroidery scissors with decorative fob, tapestry needles, thimble, crewel needles, needle threader, beading needles, thimble, milliners needles, embroidery scissors, chenille needles, tweezers, sharps needles. above, clockwise from upper left: stretcher bars, hoops, q-snaps. Other embroidery tools needle book or needle case safely stores needles in one place, keeps them organized by size, and protects you from accidental stabs. Threader is invaluable for threading multiple strands of floss or thick thread onto a needle, and will save you time and irritation. Thimble protects your middle fingertip as you stitch. it’s a personal choice; some stitches wouldn’t stitch without one, while others find them distracting. experiment to see if a thimble is right for you, and give yourself time to adjust to it. Thread Organizer keeps your embroidery threads clean and untangled. the simplest solution is a set of labeled plastic resealable bags. if you do a lot of stitching, invest in a large, sectioned box designed for stitches. , Embroidery scissors are small and sharp. reserve your scissors only for embroidery so they stay clean and sharp. keep them in a sheath to protect the points (and your hands!). Embroidery Frames holding the fabric under tension as you stitch is important if you want your stitches to look uniform and the fabric to remain free from puckers. 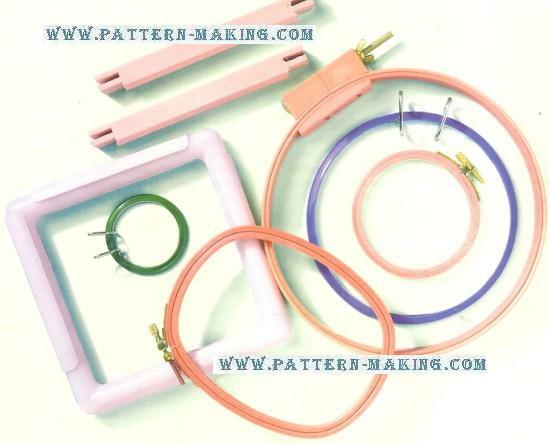 hoops are simple round or oval frames composed of a pair of closely-fitting wood, plastic, or metal rings. some rely on the close fit of the two rings to produce tension on the fabric; others have metal springs or tightening screws. most hoops are 3/8” to 1/2” ) deep and from 3″ to 8″ in diameter. because a hoop will crush stitches, choose a hoop that’s larger than the size of the design. (if you need a large hoop for your project, look for a quilter’s hoop.) removing the hoop after each stitching session will keep your fabric free from permanent creases and indentations. Q- snap s are a modular system of four plastic tubes called “elbows” in various lengths (6″, 8″, 11″ 17”, all interchangeable) that join together to form a rectangular frame. buy only the lengths you need for your project. first stretch your fabric over the frame, then snap four plastic clamps over the sides of the frame. q-snaps are as easy as hoops for mounting and removing fabric. Stretcher Bars are also modular, and consist of pairs of 3/4” square wood strips that dovetail at the corners to form a rectangular frame. (look for bars intended for needlework, not painting.) unlike the two previous methods, this frame is designed to hold the fabric for the entire time you are stitching it. attach the edges of the your fabric to the wooden bars with thumbtacks; stapling is not recommended.